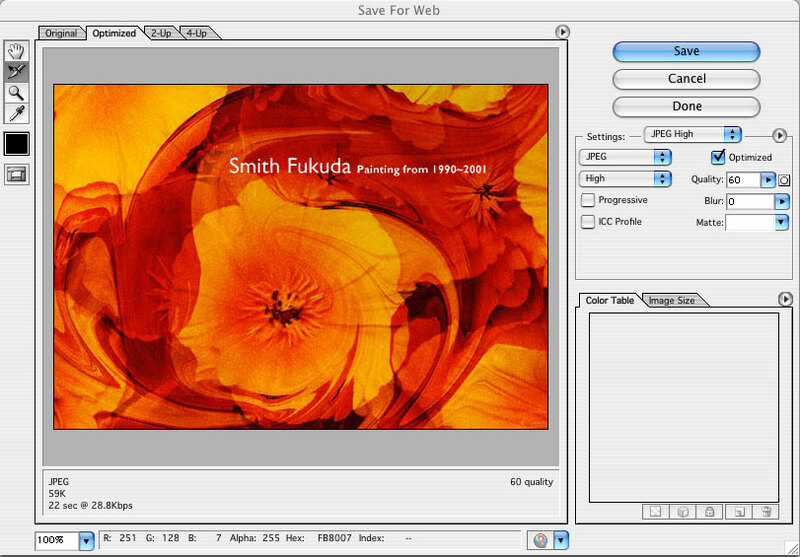 Set the artboard size to 640×480. Select all (Command + A) and holding down the shift key resize your final project to fit on the artboard. Select the Crop Area tool from the Tools palette and adjust the bounding box to crop your image. Select the 2-Up Tab in the upper left corner. This will allow you to see your original and optimized image at the same time. Present your Final Project to the class as a committed, professional designer. State your name, what you are presenting (title and design problem), which parts are successful and why, which parts are unsuccessful and why. Why did you choose the mind map concept you did? closed, filled paths to develop the structure of your map. effective organization of named layers, swatches, symbols, etc. well-crafted paths that utilize corner, smooth and combination points with economy. Successful translation of MTA graphic style to your own mind map concept. Check your grade next Thursday. If you have questions or concerns, let me know right away! Thanks for a great class. Have a good break! This entry was posted in Class 15, Lecture on May 20, 2010 by admin. Symbols are used to save time and memory. A symbol allows you to record a single copy of an image and yet use its instance many times. To create a new symbol simple drag it to the symbols palette and give it a name. To use a symbol drag the symbol to the art board. To return the symbol to its original state (editable points and lines) click the unlink button in the symbols palette. To replace one symbol with another symbol, select the symbol on the art board and select a new symbol in the symbols palette. Then click the replace symbol button. The Appearance palette helps manage the visual attributes of an object. An object is nothing more than an invisible path. Applying color gives it an appearance. Click on an object and the Appearance palette shows you what styles or attributes (stroke, fill, effects, etc.) have been applied. To clear the appearance of an object, select the object and press the Clear Appearance button. To reset the appearance of new objects, you may also press the Clear Appearance button. Command D restores the default stroke and fill values. You may also apply multiple appearances using this palette. Align Palette is used to reposition objects relative to each other or to the artboard. This palette can both align and distribute objects. Aligning repositions objects so that they line up. Distribute places an even amount of space between objects. Two or more objects must be selected to align objects to each other. Only one needs to be selected to align to the artboard. Select one of the subway map sections below and place it as a template layer in a new file. Create layers for each part of the map: topographic, roads, train lines, stops, text, etc. Using the pen tool, begin by tracing the main topographic areas of the map: water, land, etc. Next use the pen tool to create open paths for each road, ferry and subway line. Use the symbol palette to create and reuse symbols for stops and icons. For dashed and dotted lines, refer to the examples presented in class. Your final Mind Mapping project should be executed in a similar fashion as the MTA demo above. Use the skills learned from the MTA map to inspire your mind map. Don’t wait until the last minute, email with questions! This entry was posted in Class 14, Lecture on May 17, 2010 by admin. NOTE: make sure you create a backup of your file before making the following adjustments. File Info — add the Document Title (Project Title), Author (your name), Author Title (your title), Description (project description), and any agreed upon keywords. Crop and trim marks — these marks indicate where the page should be cut. They are especially important when you’ve designed artwork that contains bleeds. Bleeds are areas where the ink goes past the edge of the printed page to make sure no unwanted white space appears. There can only be one set of crop marks (Object > Crop Marks > Make), but you can make many trim marks (Filter > Create > Trim Marks). If your illustration is to be placed in a layout program, don’t use crop or trim marks. Printer’s marks — these include registration targets and variations called star targets, calibration bars and labels fro the particular separation or printing plate. The registration marks help the printer align the printing plates so that the inks are placed exactly on the paper. The calibration bars help the printer maintain the color values. These marks can be added by a check box in the Print dialog box. Specify the Transparency Rasterization Settings — The third section of the Document Setup window, Transparency, controls how an image will be rasterized on output. The Flattening settings has a slider showing the Raster / Vector balance. Dragging the slider toward Rasters makes it easier to output your artwork, because more of it gets rasterized. This however, can result in reduced quality. It is best to keep the default settings unless you have output problems. Slim the File — Delete all unused brushes, swatches, symbols and styles. Each of these palettes has a command called Select All Unused. Use that command followed by Delete. Check your Layers palette for hidden items. Show and unlock everything. If there are unneeded items consider deleting them now. Check Spelling — Correct any errors using Type > Check Spellling. Clean up the Artboard — use the menu command Object > Path > Clean Up. This can rid your document of potentially problematic points and objects. Rasterize Effects, Blends, Gradients, Gradient Meshes and Transparency — by rasterizing these objects it makes them easier to print. Some effects and filters can create very complex objects. If it takes a long time to create or draw onscreen consider rasterizing. Convert Large Type to Outlines — change headline type (not paragraphs of type) to outlines to solve printing problems. Don’t forget to include Linked Images and Fonts — if you have linked any bitmap images to your Illustrator document or if you are using a unique font you will need to send everything to the printer. Check to see you have included everything by using the Document Info palette. Remember to deselect Selections so you get data from the entire document. Halftone Screens: a printing device used to break artwork up into a series of dots of various sizes. These screens are overlayed at different angles to produce a full range of printed color using CMYK. The size of the dots determines how light or dark colors appear in print. The smaller the dot, the lighter the color appears; the larger the dot, the darker the color appears. Trapping: is a technique used by printers to slightly overprint the colors along common edges of two objects. It is used to compensate for any gaps or color shifts between the objects caused by misregistration when printing. Trapping may not always be necessary when objects share a common color. Spread: this is where a lighter object overlaps a darker object. The lighter object color “spreads” into the darker background. Overprinting: this is where an object is specified to print on top of the object underneath rather than the default knockout. It is the simplest method used to prevent misregistration. Overprint 100% black lines against a color background when the illustration style allows. Overprint when the artwork does not share common ink colors and you want to create a trap or overlaid ink effects. Remember that Process Colors are transparent. For example, if you print a fill of 100% magenta over a fill of 100% cyan, the overlapping fills appear violet, not magenta. Refer to a printed Swatch book when selecting color. Don’t use a spot color guide to define process colors and visa versa. Define the colors. It’s easy to change color definitions down the road, if needed. This entry was posted in Class 14, Lecture and tagged Output, Printing on May 17, 2010 by admin. Bring final project research and finished Combination Logos to class. This entry was posted in Class 13, Lecture on May 13, 2010 by admin. Combination Logo: is one that combines both a symbol and the company name. The text can be integrated with the symbol or in well-considered proximity. The goal as a designer it to make sure both elements are combined into an unified whole and the chosen font communicates as much information about the brand as the symbol. Choosing a Font: Creating a typeface worksheet is a good way of evaluating fonts that you like. Fonts, like software are designed by someone (a typeface designer) and most cost money to use. As a student, you can use the fonts available in the labs or free fonts. When you are out in the world designing for others, always purchase fonts out of respect for your fellow designers and to prevent legal consequences. Integrating the Type: Once you have experimented with a few different fonts at large and small sizes (remember that your logo may be printed or projected as a large as banner and as small as business card), begin to integrate the type into the symbol logo. First step is to CREATE OUTLINES (Type > Create Outlines). This turns your editable type its editable vector objects. Observe the curves or angles of your symbol logo and the type. Play around with the relationships between both. You may manipulate the type slightly to help integrate it with the symbol, but not to point of illegibility. The finished combination logo should have an obvious relationship between the type and symbol. It should not look as though the type was just thrown in next to it. Loading fonts into Fontbook, Suitcase or other font management tools. Typeface Selection to work with your icon logo. Do some real research and find a font that will work with your icon logo. We will be creating a type logo to accompany our icon logo. Research font styles. Make an informed decision as to the reason why you will use a specific font. Think about your product (you). The font you choose should reflect the persona of the product. When you find a font you want to use, consider how you will modify it to work with your icon logo. Use the non-typographer’s guide to practical typeface selection, to help you choose a typeface for your logo. Make a list of those “familiar” typefaces that you trust and know will work well in a variety of projects. Supplement that list with a list of “unfamiliar” typefaces that address any specific objectives for the project at hand. Refine your symbol logo, based on feedback. Integrate your name into your symbol logo to create a combination logo. Come prepared with the following files for Assignment #5. We will begin work on the final project next week! This entry was posted in Lecture, Week 12 on May 6, 2010 by admin. Present your logo sketches/work-in-progress to the class. Ask your peers to list some words to describe your logo. Are any of them on your list of 10 words? Scan your final logo design and set up your illustrator file with the placed image. This entry was posted in Lecture, Week 11 on April 29, 2010 by admin. A Compound Path consists of two or more simple paths that have been combined to form a new compound object. One useful aspect of compound paths is that a hole can be created where the original objects overlapped. These holes are empty areas cut out (like a donut or the letter O), through which other objects can be seen. In addition, you can use compound paths to force multiple objects to behave as if they are a single unit. For example, they could be used as a mask. The Compound Path command can be found under Object > Compound Path > Make. To release a Compound Path go to Object > Compound Path > Release. The new compound object takes on the appearance of the topmost object. The Pathfinder palette contains several tools to create a new, closed path(s) or a compound path from two or more selected and overlapping objects by merging together, subtracting from one another and dissecting into segments. The Pathfinder palette contains two rows of buttons. The upper row contains Shape Modes buttons, the lower row contains the Pathfinder buttons. For best results apply Pathfinders to filled, closed paths. Pathfinders cannot be applied to objects which have gradient mesh or effects applied, but you can make compound shapes from objects to which effects have been applied. However, only the distort and warp effects will appear in the compound shape. If you no longer need to make changes to the Compound Shape, the Expand button can be used to remove the invisible paths you no longer need. This result unifies the shapes into one path on one layer. Compound Shapes do more than just combine two or more shapes into a single object. A compound path appears as a single object on a sublayer in the Layers palette until it’s released. A compound shape appears as editable art in the layers palette with every object in the shape on a separate sublayer. This gives you much more control over editing complex objects. Subtract from shape area : Subtracts the front most selected objects from the backmost object. Paint attributes of front most object are preserved. Intersect: Creates a new object from shared space. Deletes any non-overlapping, selected objects. Paint attributes of front most object are applied to new object. Selected objects must partially, but not completely, overlap to apply this command. Exclude: Removes an overlapping area. Areas where an even number of selected objects overlap become transparent; areas where an odd number of objects overlap are filled. Paint attributes of front most object are applied to new object. Divide: Divides overlapping areas of selected paths into separate, non-overlapping closed paths or lines. The new objects keep their original fill and stroke colors. Divided objects can then be modified by using the group selection tool. Trim: The front most object shape is preserved; parts of objects that are behind it and overlap it are deleted. Adjacent or overlapping objects of the same color or shade remain separate (unlike merge command). Objects retain their original solid or gradient fill colors; stroke colors are deleted. Merge: Operates on adjacent or overlapping objects with the same fill color, uniting them into one object. If the overlapping objects have different fill colors, similar objects are united and the other objects are trimmed. The front most object shape is preserved; Objects retain their original solid or gradient fill colors; stroke colors are deleted. Crop: The front most object “trims” away areas of selected objects that extend beyond its borders. The remaining on-overlapping objects retain only their fill colors; stroke colors are removed. The front most object is also removed. Like a mask, the Crop command allows only objects directly beneath the front most object (mask) to be displayed. Unlike a mask, the original objects are deleted, unless you Undo right away. Outline: Objects turn into paths with a stroke of 0. The fill colors of the original objects become the stroke colors and fill colors are removed. Where any segments overlap, the lines are divided. Use this command to create strokes on individual sides of objects that originally had a stroke of None. Minus Back: Subtracts the backmost selected objects from the front most object. Parts of the objects that overlap the front most are deleted. Paint attributes of front most object are applied to new object. Selected objects must partially overlap for this command to work. Divide Objects Below: Cuts objects by using an overlapping front most selected object. With the selection tool, select the object to use as a cutter, and position it so that it touches the object to cut. The object cuts any filled object or objects that it’s touching. Choose Object > Path > Divide Objects Below. The shapes that result are ungrouped and selected. Outline Stroke command: Traces the outline of all stroked paths within the selected artwork and substitutes a filled object with the same width as the original stroked path. With the selection tool, select the artwork to outline. The artwork can contain filled and stroked paths; however, only stroked paths are outlined. Select Object > Path > Outline Stroke. The outline replaces the original artwork and is selected. If you haven’t already done so, EMAIL ME YOUR NAME, LAST 4 SS#’s, and PREFERRED EMAIL. Students that did not present their work last week will have the opportunity to do so. Turn in Assignment #4 (finished or in progress) to the DropBox for feedback. Record any missing student audio. On paper, create several versions of a black and white symbol logo for yourself, one that embodies your identity as a professional. Go to GoodLogo.com or this Corporate Identity Catalog to see some logos that have stood the test of time. Choose one logo and print it out. In your sketchbook, mount the logo and write a paragraph discussing why it is successful. Also take a look at Corporate Identity Resources and view how companies create very specific guidelines for use of their logos and branding. Write down 10 words that you use to describe yourself as a designer or just a person. Think about what kind of image you want to project. Is your style conservative or edgy or somewhere in between? How do you want to differentiate yourself from others? What makes you special? These will all be factors in developing your logo. Make sketches of a symbol logo that is recognizable, simple and reflects your values. Make sure others could describe your logo with at least 2 of those 10 words you use to describe yourself (see above). Bring in at least 3 hand drawn versions to scan in. This entry was posted in Lecture, Week 10 on April 22, 2010 by admin. Add in final audio. See midterm guidelines. Submit all projects and reworked versions for midterm grade. NOTE: Only completed projects will be presented and critiqued. Presentation is 20% of your overall grade. Has the student followed the project guidelines? Has the student demonstrated a mastery of the pen tool, layers, color swatches, use of tracing image? Does s/he know their project topic backwards and forwards? Is the student speaking in a clear, professional, confident manner? The class will vote on the 2 most successful projects. Based on the tutorial in class, create a bird guide using your bird illustration and written research text. Use the guide provided under Assignment #4 to get started. Your final layout should utilize at least three of the techniques we covered in the class demo, including Type Outlines, Text Wrap and Columns of Type. This entry was posted in Class 9, Lecture on April 15, 2010 by admin. Research your bird. Prepare a 1-2 paragraph introduction to the bird and 1-2 paragraphs outlining the effects of human activity on the bird population. Save this file as a text document in Word or TextEdit. Present your project to the class. Midterm Project is due — NO EXCUSES. Re-read the Midterm Project Description to make sure you have followed the guidelines. This is a MAJOR factor in your grade. If you have not completed your midterm project, you are still required to come to class to participate in the critique. Come prepared to present your project to the class, as if you are presenting to a client. Do you know your project topic backwards and forwards? You will present your work as a committed, professional designer. All classwork is due. If you’d like to turn in re-worked versions of your previous assignments for an improved grade, be sure to name your files with the correct project title and the version number. Send me an email with your full name and the last four digits of your Social Security number. Use the Contact Form on this site. This will allow me to enter you into the grading system. This entry was posted in Class 8, Lecture on April 8, 2010 by admin.